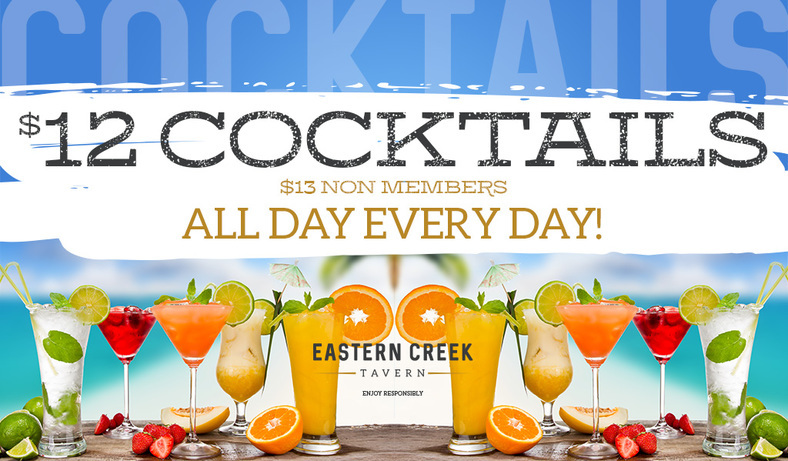 Eastern Creek Tavern is known as a staple for those who work and live in neighbouring suburbs, whilst also a convenient pit stop for visitors to the area, who are seeking a relaxed setting to enjoy refreshments and great food. Our newly refurbished hotel features a large public bar, modern dining area, brand new TAB and an outdoor beer garden which is the perfect place to enjoy a few cold ones. Easter Creek Tavern also features a Liquorstax bottle shop with an impressive product range, as well as extensive onsite safe parking for the convenience of our guests. We are only a hop, skip and a jump from Sydney Motorsport Park, Wet'n'Wild, Featherdale Wildlife Park and Eastern Creek International Karting Raceway. Our bistro offers a great range of pub classics and bistro favourites, available lunch and dinner, as well as a special ALL DAY menu for your convenience. We serve a great range of beers, spirits, wines and soft beverages. Our friendly and knowledgeable staff take pride in serving quality beverages to wet your whistle. Attention caffeine lovers: we also serve espresso coffee made fresh by our staff who are trained baristas. 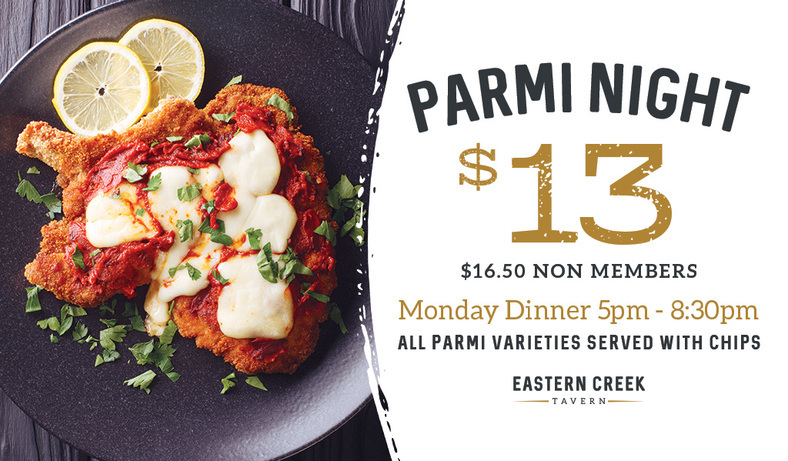 Mondays are madness at the ECT with $13 Parmi's! Well known for the best Parmi's in town, pop down and make your Monday a Parmi Night! $10 Members Pasta Night! 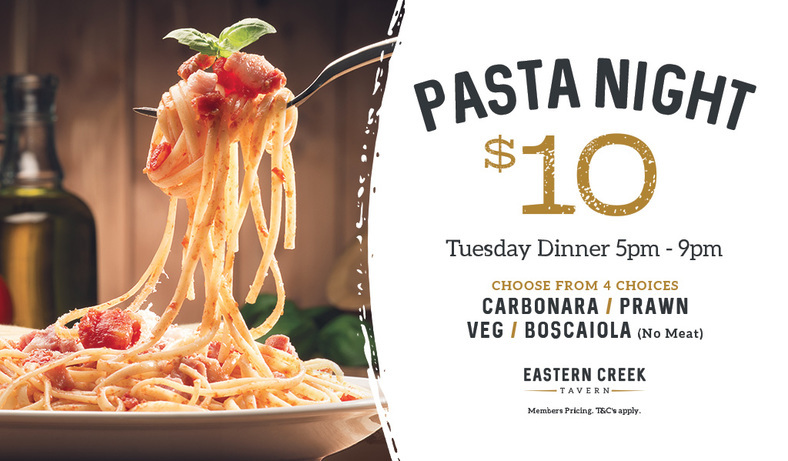 Feed the family from a choice of 4 pastas for only $10! 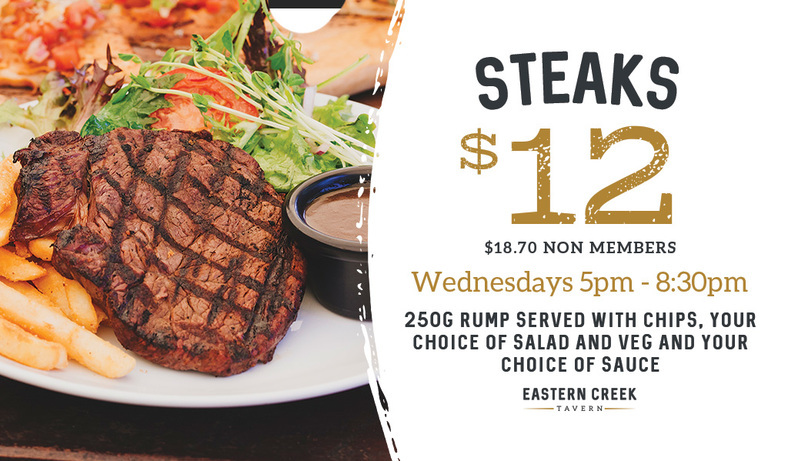 Wednesday nights are $12 Steaks at the ECT for all Members! Pop down and treat yourself to a 250g Rump served with chips and your choice of salad or veg as well as your choice of sauce for only $12! 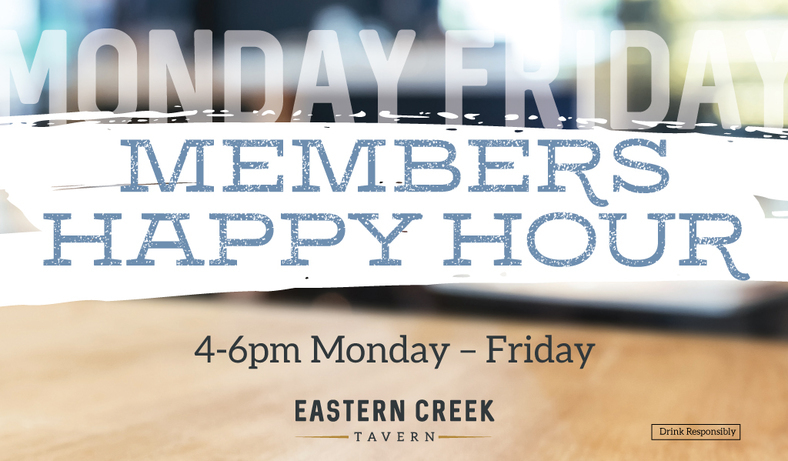 4-6pm are the happiest hours of the day, with Members $5.20 draught beers at Eastern Creek Tavern available Monday to Friday! 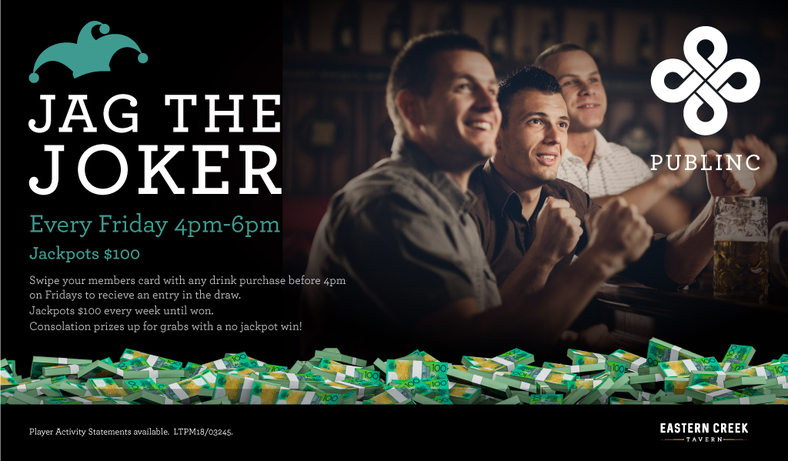 Have your chance at jagging the Joker every Friday between 4pm and 6pm with any Bar purchase! Everyone's a winner with consolation prizes up for grabs if you didn't get lucky at jagging our Jackpot! Join us for lunch on Fridays between 12pm and 2pm and receive a ticket on ANY Bar or Food purchase for your chance to win a free meat tray! 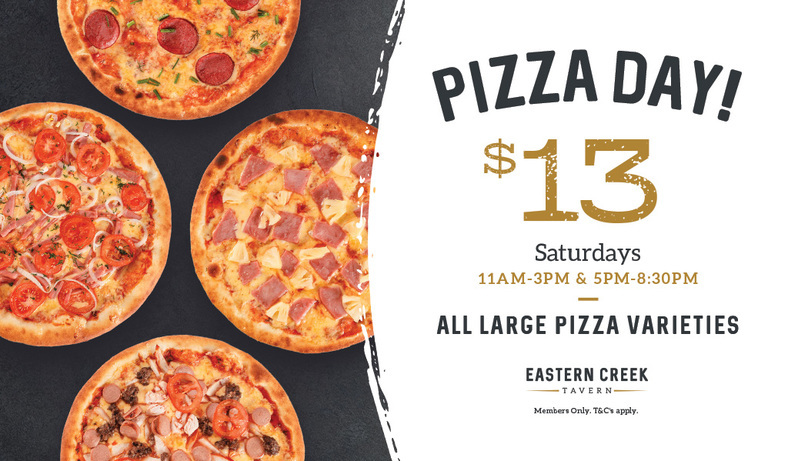 The weekend is here - make Saturday a Pizza Day with ALL large Pizzas for only $13! Available both Lunch and Dinner! 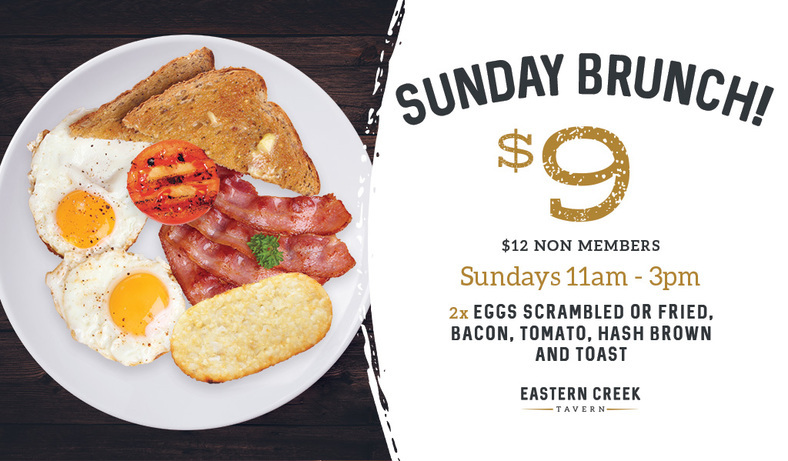 Join us for a lazy Sunday Brunch for only $9! JOIN THE ECT COFFEE CLUB! 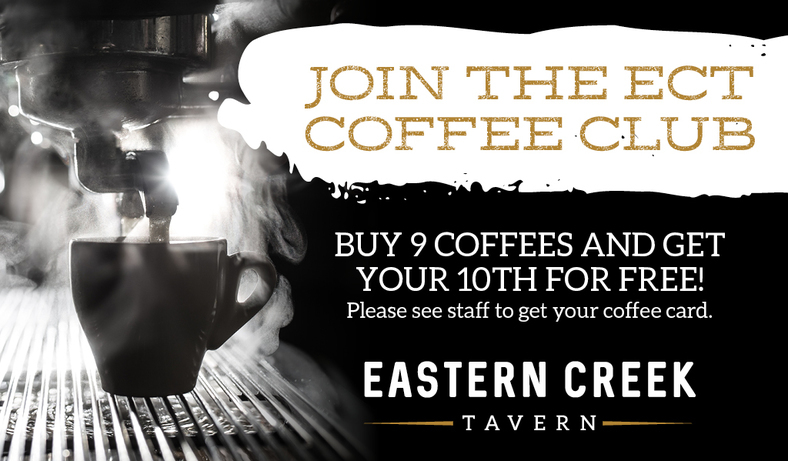 We are big on quality barista made coffee - join our coffee club and enjoy your 10th coffee on us! Pop down and let us know what you think! We are now serving refreshing Cocktails all day every day for only $12! FREE GARLIC BREAD ON US! 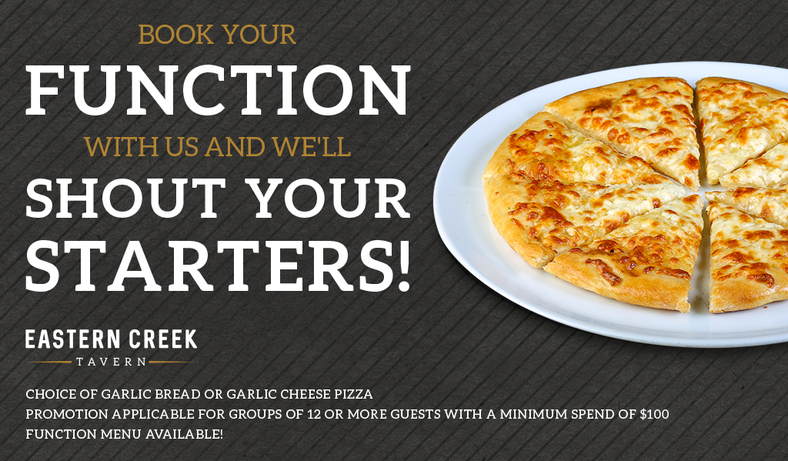 Swipe your Publinc Members card on any Bar purchase for your chance to receive a FREE garlic bread, on us! Looking for a good cheap feed? Why not try our meals under $12 which are available all day every day! BOOK YOUR FUNCTION WITH US! Book your Function with us and receive FREE Starters for your table! Eastern Creek Tavern is home to one of Sydney's premier VIP Lounges. The outdoor Dragons Den is open till late, 7 days a week. Our hosts are committed to ensuring your experience is always exceptional. Eastern Creek Tavern is proudly an official Publinc venue. The Publinc program provides its members with great benefits, rewards and exclusive access to promotions at over 27 locations in NSW. Eastern Creek Tavern is an official Publinc venue. Publinc Advantage membership is your key to access great benefits every time you visit Eastern Creek Tavern and 27 other venues across Sydney. Eastern Creek Tavern's Liquorstax bottle shop offers a great range of products and excellent value for money. Our team of knowledgeable staff are ready to help you find exactly what you need, every time. Look out for our red hot weekly specials and offers. If you have any feedback or would like some more information about Eastern Creek Tavern, please complete the below form, email or call us – we would love to hear from you!